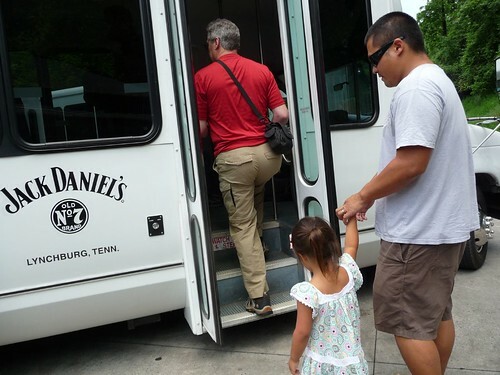 Mali Mish – Day 96: Jack Daniel’s Distillery at Lynchburg, Tennessee. 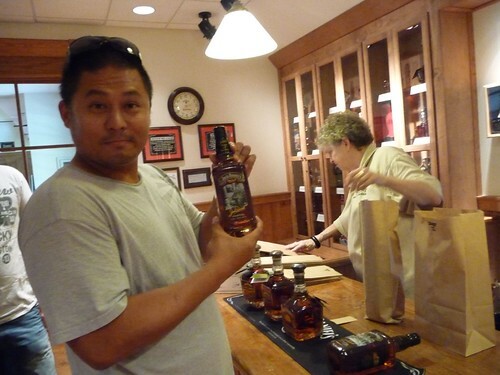 Day 96: Jack Daniel’s Distillery at Lynchburg, Tennessee. Chattanooga well exceeded all of our expectations and we were kind of sad to leave so soon but there is much more of Tennessee we plan to see. We packed up and hit the road this morning headed towards our next destination, Nashville. 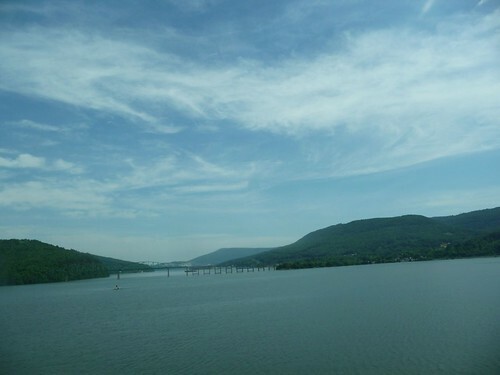 Just up the Tennessee river. With a couple hundred miles on the agenda today, we needed a good half way point to stop for a little break. 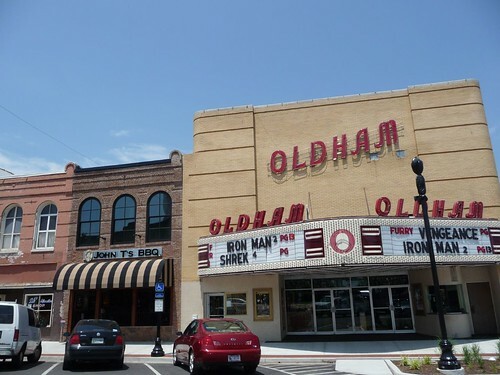 A quick look on the map we found the answer staring us right in the face – Lynchburg, Tennessee. 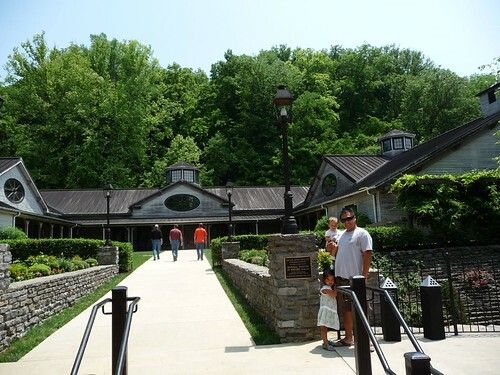 Home of the countries oldest registered distillery, Jack Daniels. To get to Lynchburg, we hopped off the interstate and drove down some of Tennessee’s country roads. 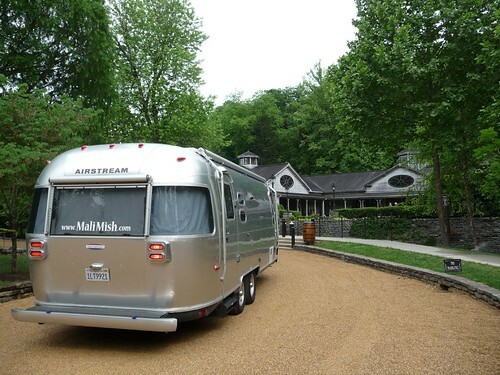 These must be some of the most pleasant miles you can roll under your Airstream with gentle rolling green hills and scenic small towns dotting along the path. 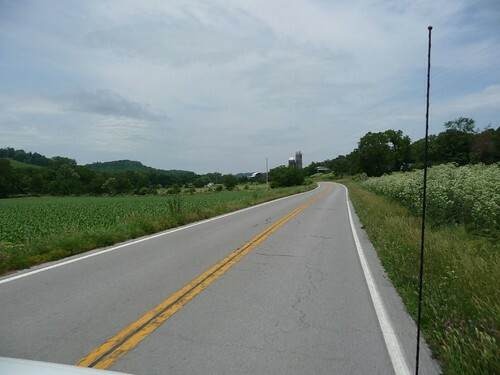 Even though it might take a little longer to get to our destination by driving these 2 lane roads, it certainly makes the drive much more enjoyable. We just do not see fields as green and air as fresh like these in California. 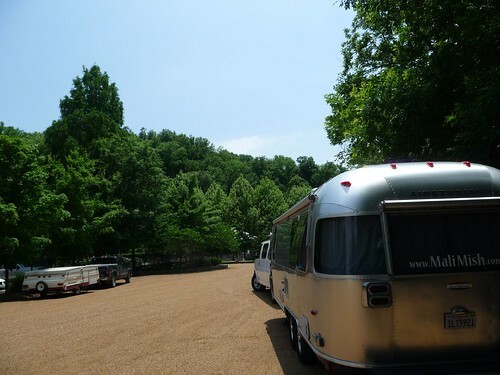 We pulled into the small town of Lynchburg and right into the RV parking lot of the Jack Daniel’s distillery. There are plenty of space for us being mid-week and only one other pop up camper was in the lot. We are not much whiskey drinkers ourselves and knew very little about the Jack Daniel story before coming here so we walked in here not really knowing what to expect. The tours here are free and run every day so we walked into the lobby and perused around the exhibits on display. 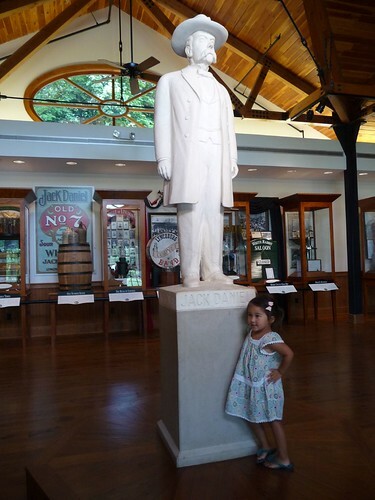 Ava was pretty impressed at this life size statue of Jack himself standing on a pedestal. All 5 foot 2 inches of him. Soon we were corralled into a room where a short film is screened that gives us a little background of the distillery before heading outside to start the tour. The tour starts with a short bus ride to the top of the property as our tour guide explained some of the rules and what to expect. 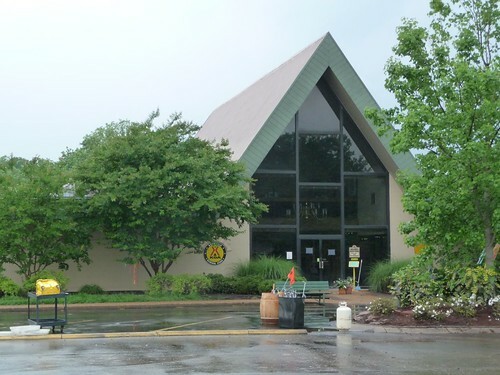 One of the interesting thing about Lynchburg is that it is in a dry county where the sale of alcohol is prohibited. That also means that we will not be doing any tasting on this tour. I know, what the hell? 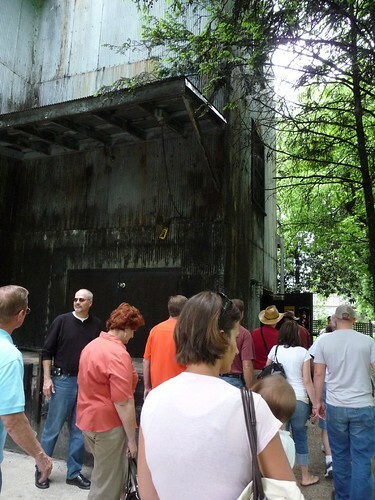 At the top of the hill, we get to our first stop which is these 2 giant furnaces. 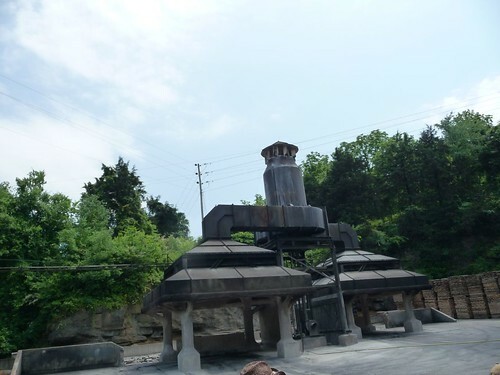 These furnaces are key elements of what distinguishes Tennessee Whiskey form Kentucky Bourbon. Unlike their cousins in the northern border, Tennessee Whiskey goes through a mellowing process which filters the whiskey through charcoal to remove some of the impurities. These furnaces burn the local sugar maple wood that is used to make the charcoal used for filtering. It is unique in that the sugar maple charcoal leaves no trace and adds no flavor to the whiskey and has been used as the charcoal of choice dating all the way back to Mr. Daniel himself. They go through as much detail as to using only the 140 proof whiskey as the lighting agent so no other elements that might taint the flavor might be introduced. Jack Daniel’s takes pride in the fact that nothing here goes to waste as the used charcoal packaged and sold for consumers who might want to use it to add some flavor to their backyard BBQ. Out in the distance on the hill we were shown one of their many barrel houses that the whiskey rests and ages. There are several barrel houses this size and this one alone stores over 14 million dollars worth of whiskey. Of that 14 million dollars, Uncle Sam’s take is 60%. I knew that we taxed hard alcohol a lot but I had no idea that it was that extreme. The government does not have to take on any of the operating cost and overhead of running a distillery yet it makes a majority of the revenue. I never knew drinking whiskey was such a patriotic deed. If you didn’t know already, the government takes its tax collection very seriously. They are so serious about taking their 60 cents on the dollar here, they have on-site IRS agents working full time just to make sure no funny business is going on. Lynchburg being the original site of where Jack Daniel first started making his whiskey, there are a hand full of unique properties that keeps them here. 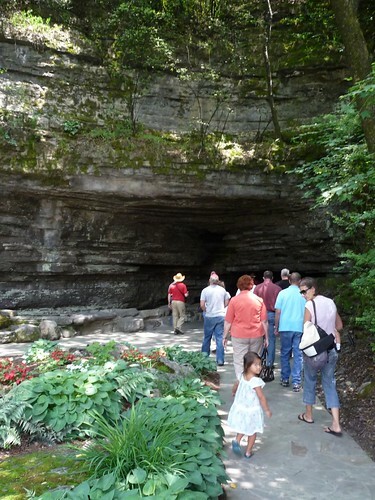 All of the Jack Daniel’s Whiskey ever produced has come from here and in fact, each drop of liquid all originated from the spring water right inside this cave. Near the cave we were shown the original building that was used and inside was the original office where Jack once worked. 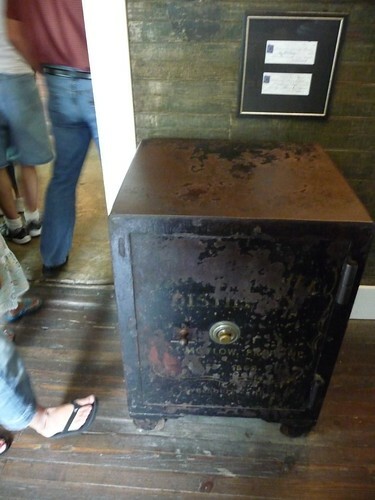 Along with a desk and some book shelves, there is also this floor safe that has an interesting story. Jack Daniel’s takes a lot of pride in the quality of their product. 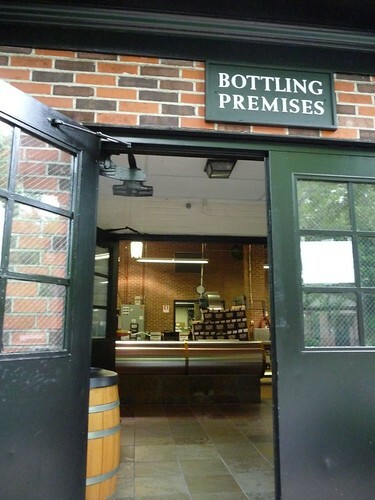 Every bottle of Jack that comes out of here is expected to taste exactly the same as it did in 1875. 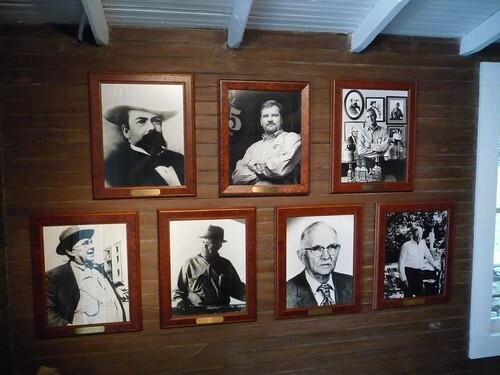 That is why in the 135 years of its existence, there have been only 7 master distillers, starting with Jack Daniel himself. 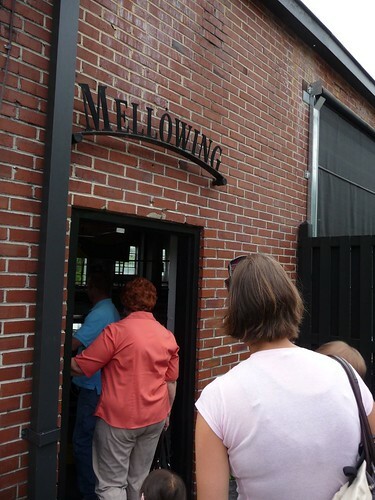 Our next stop was the mellowing room where tanks 10 feet tall filled withe sugar maple charcoal is used to filter the whiskey fresh from the still drop by drop. Unfortunately we were not allow to take photos of the inside so this is as good as we can get. Even though tasting is not permitted in the dry Moore County of Tennessee, you’d probably get enough whiffs of the whiskey to feel a bit light headed if you really tried. After all, this stuff is 140 proof (70%) as it comes out of the still. The closest we got to taste the whiskey is when our guide told us to lower our heads near the edge of the locked lids on the 10 foot tall mellowing tanks as he slammed the lids up and down allowing some of the whiskey vapors to escape right into our noses. Outside the distillery you see all of the trees and bushes have black bark on them. That is not a natural occurrence of the vegetable but rather caused by the proximity they are to the distilling process. This was one of the ways the government were able to catch home distillers back in to the days of prohibition. 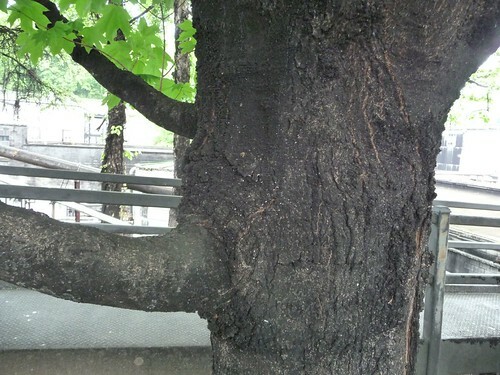 If you’ve got black bark on a tree, there is probably some liquor making inside of the building next to them. Since we are not allowed to take photos of the inside, this one is about the only one I can show you that gives you a glimpse of the bottling facility. Each and every bottle of Jack Daniel’s that gets shipped worldwide comes right out of here and on to a truck. Our last stop of the tour was this old barrel house. This is one of the older and smaller barrel houses on the property. Aside from the strong whiskey smell inside as you walk by barrels stacked sky high, it is actually naturally cold inside. Today was probably high 80s low 90s in Tennessee but inside of the barrel room, it cools down to a brisk high 60s low 70s. The barrel rooms are not mechanically cooled whatsoever and the temperature is completely due to the natural cooling effect barrels of alcohol has on the environment. 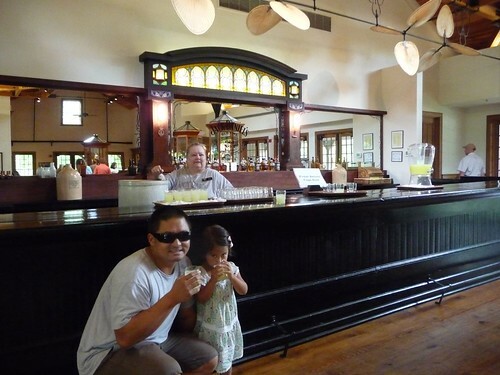 At the end of the tour, we finally got to belly up to the bar and get a drink. Except instead of getting a shot of whiskey, we got glasses lemonade. Ava didn’t seem to mind too much. 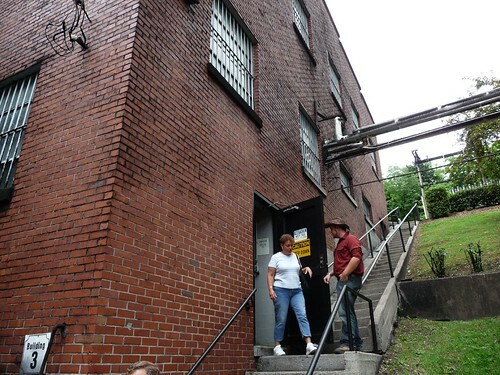 Even though selling of alcohol is prohibited here in Moore county, the state of Tennessee did see that irony in the fact the one of the world’s largest whiskey makers is unable to sell its product on its premise. They fixed that recently by passing a law that specifically lets them sell collector’s bottles of the famous Old No. 7. I couldn’t pass that up especially since one of the bottles for sale was a limited edition that is only sold right here in Lynchburg and nowhere else. What was that? Did you say ‘sucker’? Whatever. 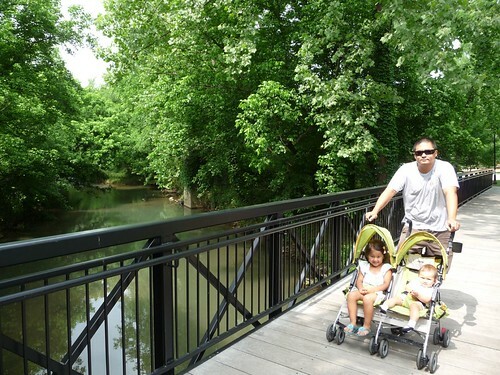 Just a short walk from the distillery was the town center of Lynchburg. There is basically no one who lives here that doesn’t work directly or indirectly with the distillery. I am sure even this ice cream shop has something to do with Jack Daniel’s. Of course if it wasn’t for them, we wouldn’t be here today. We usually don’t expect a lot from short traveling day stops but today’s visit at Lynchburg was a surprise. It is a place I would definitely recommend anyone to check out if you are ever in the area. You just can’t beat a great tour that is also free. We got back in the car and continued our way to the post-flood city of Nashville. We had some reservations about coming here but ultimately decided that we did not want to pass it up regardless of its state. 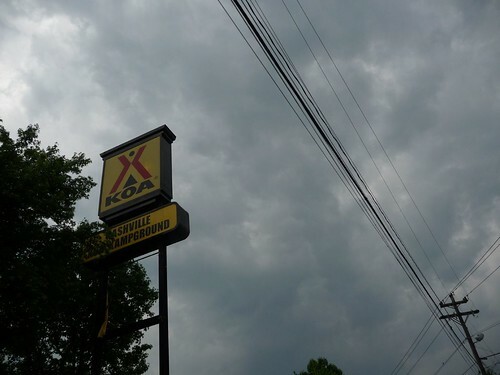 We got into town and called the KOA that is right down the street from the famous Grand Ole Opry to see if they were open. Even though the Website said they were closed for business, they still had some of their sites in good operating condition. Even though cable and wifi are out of order, we did get full hookups otherwise for only $25 a night. 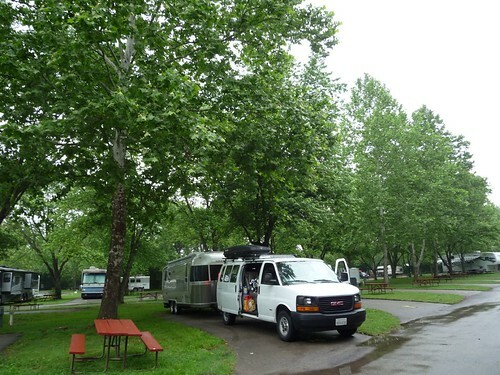 The Nashville KOA is setup with one side slightly higher in elevation which is why it survived the flood. The registration office however was not so lucky and was flooded several feet up and out of commission. 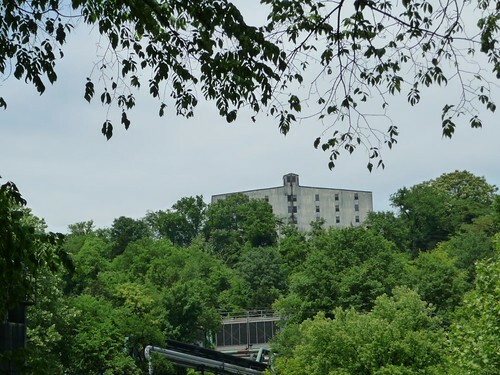 From some of the reading we did of people who stayed here, they recall staying on the higher level looking down at what looked like a lake with vehicles and RVs just floating around and bumping into each other. Hopefully the worst is behind them and rebuilding is well underway here at Music City as far as we can tell.